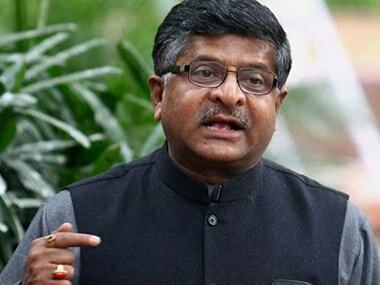 Ravi Shankar Prasad, India's Law and Information Technology Minister, has an unenviable task cut out for him: To maintain a delicate balance at a time when the 'Judiciary versus Executive' debate has become sharper than ever. 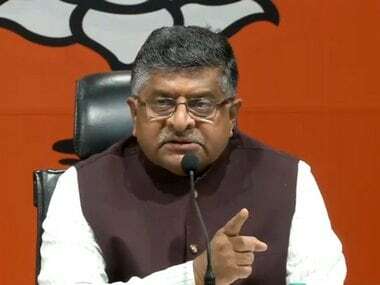 In addition to this, Prasad, as one of the most articulate leaders in ruling BJP's ranks, is also expected to pitch for the party to counter the Opposition's narratives and to try and build a positive public opinion of the party. In a free-wheeling chat with Firstpost's Sanjay Singh, Prasad spoke on a wide array of subjects including demonetisation, judicial overreach, government's conflict with the Judiciary over appointment of judges, triple talaq, and Rahul Gandhi's earthquake statement. FP: The Supreme Court had asked the government whether it had a plan on demonetisation at all. Did the government anticipate that the apex court could take such a serious stand on the move? RSP: The Attorney General is explaining the government's position. It will not be proper for me to comment on the case, as it is still pending. FP: Confrontations between the Judiciary and the Executive have become more frequent recently. How do you, as Law Minister of India, see it? RSP: Our (BJP's) commitment to the independence of the Judiciary is complete and total. 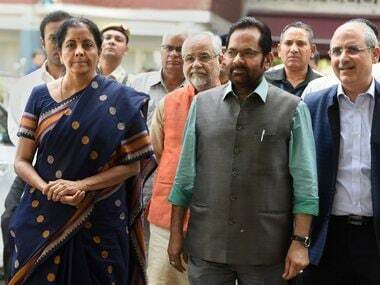 This government is led by Prime Minister Narendra Modi and there are four-five senior ministers in the government – Rajnath Singh, Sushma Swaraj, Arun Jaitley, Venkaiah Naidu and Ravi Shankar Prasad. More or less, all leaders, some senior in age while some juniors who were prominent student activists, have fought against the emergency in one form or another. I myself began with the Jayaprakash Narayan (JP) movement. In Bihar, we started the movement much earlier with JP. In the fight against emergency, we fought for three freedoms – individual, media and independence of the Judiciary. (cuts across) RSP: I'm coming to that. Therefore, we belong to a government where we have suffered for the cause of independence of Judiciary. Now you must understand the broader framework...70 years down the line, India has become independent. Some constitutional issues have become well settled. India will always be governed by democracy and popular franchise. Elections have to be free and fair. People know that they can unseat any leader or any party at the Centre, howsoever popular. Number two, individual freedom, media freedom, freedom of speech and expression are sacrosanct in the country, subject to limitations under the Constitution. Number three, the Judiciary has got the power of judicial review, which means that they can satisfy any government order, they can annul any law passed by the Legislature, and they can give any direction. But, there is also an ethos of the Constitution, which I personally articulated on Constitution Day before the Supreme Court lecture by MN Venkatachaliah – Governance must be left in the realm of those elected by the people of India and legislation must be left to the realm of those elected to legislate by the people of India. These constitutional parameters are also well settled. FP: This is a very loaded statement...do you mean that there is a settled parameter for the Judiciary and that it should understand that? RSP: I'm not saying anything more than what I feel as a student of India's Constitution. FP: Recently, the Supreme Court asked high courts to not encroach in the domain of the Executive and Legislature. As a student of the Indian Constitution, and as the law minister of the country, do you think that judicial overreach in the Executive domain is creating tensions? RSP: No. The Supreme Court itself keeps cautioning about certain things; as you saw in the case of Allahabad High Court. The Supreme Court said that 'don't go for judicial overreach seeking legislation'. I'll leave it to them. We trust the Judiciary completely. But we also uphold the institution very dearly in the growth of Indian constitutional democracy. And I speak because you know my background in the fight against the fodder scam, and in seeking accountability for loot of public money in the bitumen scam. I know the Supreme Court and have great respect for the Judiciary. But acknowledgement of the constitutional ecosystem is also required. (cuts across) RSP: I would not like to make any comment except for flagging two or three things. We passed the order in the National Judicial Appointments Commission (NJAC) and it was unanimously passed in both Houses of Parliament, without a single dissenting point. It was also unanimously passed by 50 percent of state legislatures, without a single dissenting note. The Supreme Court chose to set it aside. We respected the judgment. I have two comments on that. Since 1990, on an average, 80 judges are appointed every year. In the year 2016, we made about 125 appointments, the highest in a year. The previous high was 121 appointments, in the year 2013. FP: Where is the problem then? RSP: We have made four Supreme Court judges' appointment, and 124 additional judges have been confirmed. Many high court chief justices have also been appointed and transferred. As of 30 June, 2016, there are about 5,000 vacancies in the district courts of India (4937 to be exact). The Centre or state governments have no role to play in the appointment of the subordinate Judiciary. As a senior journalist, you would know that it is done by the high courts themselves, or on their recommendations by the public service commission. Of the 430 vacancies in high courts, names have not been given for 280 seats. When the high courts will give the names, we will recommend them...we'll surely expedite. The same Supreme Court judgment had also held that the Collegium system needs improvement, as it lacks transparency. There has to be fairness, objectivity, some degree of screening appraisal etc. It's all part of the 15 December judgment. They had asked us to submit the Memorandum of procedure (MOP), which was to be decided by the Supreme Court chief justice, in consultation with the four-member Collegium unanimously. The government's stand is pending before the Supreme Court since 3 August. Therefore, if the judgment is binding on us, it is equally binding there, due to the mechanism. About 4,000 suggestions were requested by the people of India, as per the Supreme court and 1,200 were filtered by a community...so I think there is a need to improve the Collegium system as well. There is a judicial mandate and we have done our best. FP: Now lets turn to the issue of triple talaq. The Allahabad High Court had called the practice 'unconstitutional' and 'unfair to rights of Muslim women'. What are your views on the matter? RSP: The Supreme Court had asked the government of India to explain its position on triple talaq, in a pending case. Our stand is basically three-pronged. First and foremost, various parts of the Constitution, particularly the fundamental rights, highlight the abiding values of gender justice, gender equality and gender dignity. Our founding fathers chose to give the right to vote to women, the right to live with dignity, and the barrier against non-discrimination, even before other parts of the world thought of including these provisions. Triple talaq squarely fails on the benchmark of gender justice. How can you, in a constitutional India, allow such a discriminatory practice to survive? The second point is that we respect the freedom of religion and the freedom of conscience. That's a part of fundamental rights as well. But every undesirable or pernicious practice does not form the core of religion, or the right to freedom of conscience. Can anyone say that I can practice untouchability against the Dalits because my religion tells me to do that? (cuts across) FP: Do you mean that the Allahabad High Court judge was right in his observation? RSP: My affidavit has been filed earlier and the matter is pending before the Supreme Court. I'm speaking on a larger issue. The third point is that about 20 Islamic countries have either regulated triple talaq or have completely prohibited it – like in Jordan, Egypt, Morocco, Turkey, Indonesia, Malaysia, Bangladesh, Pakistan and Afghanistan. The point is that if in acknowledged Islamic Republics or countries, regulation of triple talaq through state action has not been found to be in violation of Sharia law, then how can this argument be raised in a secular country like India? 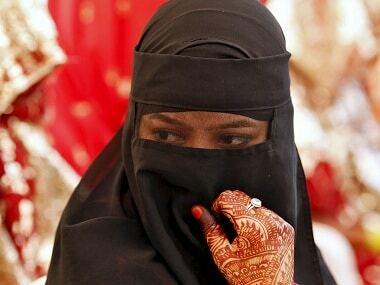 FP: Why do you think triple talaq has become a huge political issue? RSP: I think it is a question of redrawing the whole minority narrative in the country. FP: Why, in your opinion, have Congress, Samajwadi Party and Bahujan Samaj Party refrained from taking a position on triple talaq? RSP: The minority are equally a part of India. 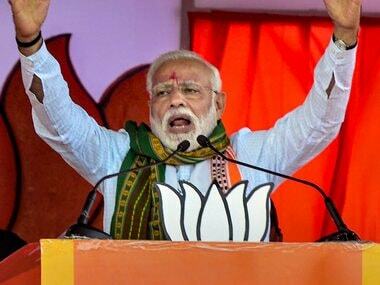 The prime minister had said, quoting Deen Dayal Upadhyaya, in the BJP National Council Meeting that, "you neither over-patronise them, nor you over-ignore them. You just adopt them. Unko Apnao." FP: Modi had come out strongly against triple talaq in a rally in Mahoba, Bundelkhand. Is the BJP trying to play triple talaq as an excuse to push for Uniform Civil Code (UCC)? RSP: No. First of all, UCC covers a much larger canvas. UCC is being debated in the Law Commission and we have instructed that anyone should be allowed to weigh in on the subject. Once the debate and consultations are over, the government will see how to go about it. FP: Are you going to ask Congress and other political parties for their position on UCC? RSP: The Law Commission will enquire, not the government. Even the BJP may be required to explain its stand before the Law Commission. In our view, there should be a wide and open debate on the matter. 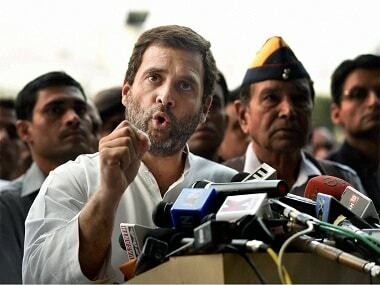 FP: When Rahul Gandhi said that the earth would shake if he was allowed to speak in Parliament, how did you respond. Are you not letting him speak? Are you, as Gandhi says, afraid of his speech? 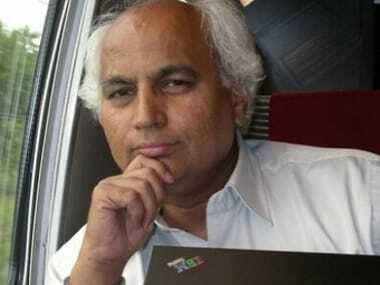 RSP: He (Rahul) has already shaken the roots of his party under his leadership. I think the more he speaks the more there will be earthquake in his own party. But I can understand his frustration. Since the day he took over the leadership of his party, there has been nothing for him to comment on; except for the 22 Vidhaan Sabha seats in Uttar Pradesh. Congress is struggling pan-India, from Lok Sabha to state elections; even in Arunachal Pradesh BJP is winning...Assam we are winning. The people of India don't find Congress worthy enough for even Municipality elections – as you saw in Maharashtra,Gujarat and Rajasthan. FP: What do you make of it then when Gandhi says that Modi will be rendered speechless when he speaks? RSP: I'm not supposed to sit in judgement over his arrogant self-certification. But I am very keen to hear him speak and I have said so publicly as well. Let him read his speech...no problem. FP: Will you then give him an opportunity to speak? RSP: The question is over the kind of language he uses in political discourse and in criticising the prime minister. Is he living up to the legacy he claims to represent with this kind of language? FP: So does that mean that you will not let him speak? (cuts across) FP: Which means that you will not allow him to speak until a structured debate takes place? RSP: It cannot be that you speak and when our turn comes, you start creating disorder in the House...not even heeding to sage advice of the honourable President. Let it be on record that when the 16 November debate had started, Anand Sharma, Sitaram Yechury, Ram Gopal Yadav, Mayawati...everybody had spoken. We even heard pearls of wisdom from former prime minister Manmohan Singh after a long time. And even though he didn't take a single step against black money in his tenure and a series of scams had completely overpowered his government, he still spoke. (cuts across) RSP: No, first listen to me. What happened thereafter? They said let the prime minister come; he came. They said let him come beyond the question hour; he came beyond the question hour. Then they again gharoed him. So who is running away from the debate? We are very clear...we have heard you. And in spite of the fact that you showered abuse on the prime minister, we will hear you again...but, be reasonable and hear our side as well. FP: Why do you think all parties are against you on the issue of demonetisation? RSP: Not everyone. The people are with us. Nitish Kumar, Naveen Patnaik and some other chief ministers are also with us. The major issue here is that how the BJP is perceived, how Modi is perceived. He is seen as someone who is standing for the rights of the poor in the fight against black money and dishonesty. We have redefined the political architecture of the country. It used to be Congress versus the rest; now it's BJP, plus the BJP allies, versus the rest. Their opposition is a result of the great metamorphosis we have brought to the Indian polity. There were certain common factors that we used in our fight against the Congress; now they have gone to the Congress in their fight against the BJP. Good luck to them. FP: Do you think that the cash flow restriction is going to hurt the BJP, as people are now getting agitated? RSP: People are whole-heartedly supporting demonetisation. The prime minister had earlier said that there will be 50 days of inconvenience to implement an initiative of this magnitude. Even today, people are appreciating his move. I can assure you as the IT minister of India. I will talk to you separately about how India is making big strides towards becoming a cashless economy in detail.